Superwang Wifi Display Dongle, Full HD 1080P WiFi Wireless Display Receiver Dongle HDMI TV Mini DLNA Airplay Airmirroring for Android,IOS, HDTV Smart Phones Notebook Tablet PC by Superwang at Pacs BG. MPN: 4328624043. Hurry! Limited time offer. Offer valid only while supplies last. 【Attention】 1. Prefer buyer ever use Airplay / Miracast casting function before. Otherwise, Read the 'step by step' instruction. 1. Prefer buyer ever use Airplay / Miracast casting function before. Otherwise, Read the 'step by step' instruction. Contact customer service before return product. 2. WiFi display dongle is NOT COMPATIBLE With NETFLIX, HULU, Directv, Amazon Prime videos and other paid subscription videos. 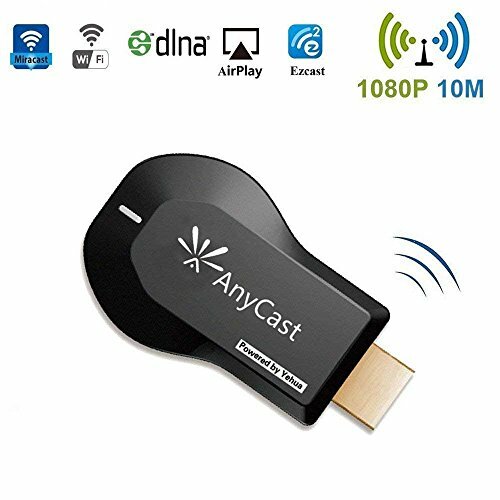  Miracast Dongle is Developed and Tested for the Highest Level of Quality. Step 1: Plug into HDMI port. Set your TV to the HDMI port you picked. Step 3: Mirroring(iOS) Pull up Control Center and tap "Airplay Mirroring". Once you tap it your iPhone/iPad screen will now be cast to your TV. Step 1: Mirroring(Android) Pull down "Control Center" on your phone and turn on Miracast (Screen mirroring/ Multicreen / Smartview) and select it. Update Online Available:Wireless HDMI Display Adapter New version has been released to support iOS 11. Connect Anycast to your home WiFi to Upgrade it if you use an iOS 11 device. The Install And Update Steps: Description Part. Application:Miracast Adapter Supports Car HDMI, Like CarPlay.Streaming Video From Phone to Big Screen,Wide Used In Business meeting, Home theater,Game experience. Eye-protecting! Attention:1. The Anycast dongle must be powered by 5V/1A power adapter. 2. Not Compatible with Google Home APP,Netflix,HBO go, HULU and Honda motor. 3. Please check whether your Android smart device supports MiraCast(if not, it not works). If you have any questions about this product by Superwang, contact us by completing and submitting the form below. If you are looking for a specif part number, please include it with your message.